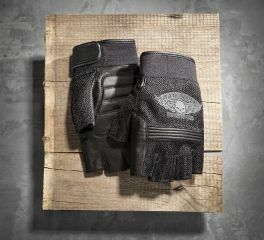 Harley-Davidson men's fingerless gloves are a great combination of protection from the elements, style, and control. Whether you prefer leather, mesh, or gel, we've got the ideal fingerless gloves for every season. 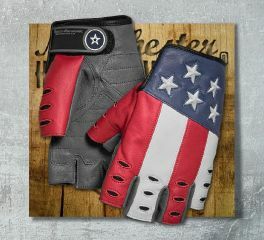 A salute to freedom and a comfortable grip with the Patriot Fingerless Gloves. 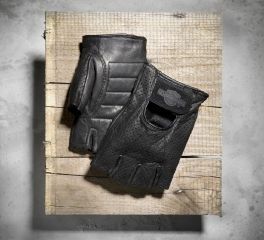 Stretch knuckle cutouts offer great flexibility and the bold style of these men's fingerless gloves makes a great contrast to a classic black leather motorcycle jacket. Fit & Mobility: Ergonomic thumb. Stretch knuckle cutouts. Adjustable closure. Ride-Enhancing Features: Reinforced palm. Webbed finger pulls for easy removal. Reflective dimensional stars. Want to go for a ride during summer? Men's Black Mixed Media Fingerless Gloves with Coolcore™ Technology is one of the best choice. Coolcore™ Technology offer year-round comfort through thermal regulation. The innovative chemical-free Coolcore™ fabric expertly manages heat and moisture through three distinct functions: moisture wicking (to absorb sweat away from skin), moisture circulation (the fabric allows air to circulate), and regulated evaporation (as air circulates, moisture is released). It all works together to help keep you cool and comfortable. The Removable Pad Fingerless Gloves come with something extra – four removable pads. These cushioned palm inserts easily slip in the concealed palm pocket to add extra padding. Prefer a leaner grip? Just remove the extra pad. The climate friendly leather-and-mesh construction and padded inserts keep you in control of your comfort. Men's fingerless gloves can run light on functional features. But our Interface Fingerless Gloves deliver essentials like mesh for more breathability and power-stretch knuckles to grip without feeling constricted. It adds up to greater comfort; longer rider. The ergonomic thumb and gel-padded palm of the Winged Skull Fingerless Gloves provide added comfort while riding and help fight hand fatigue. 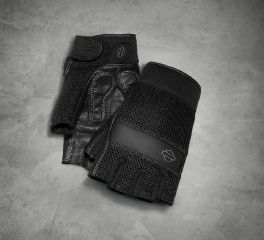 Staying true to traditional biker styling, the Centerline Fingerless Gloves are constructed from genuine leather and have an adjustable wrist closure. Reflective material has been added to enhance nighttime visibility. 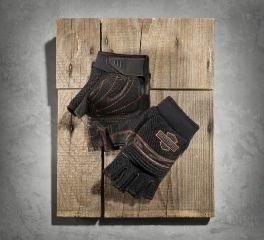 H-D® fingerless gloves are a symbol of biker heritage. 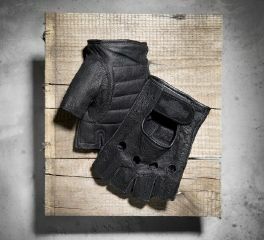 Designed to grip the handle bars, these gloves are full-throttle cool!